Experience sharp visuals and dynamic audio at any moment with this handy 2-pack of 3m long HDMI 2.0 cables. 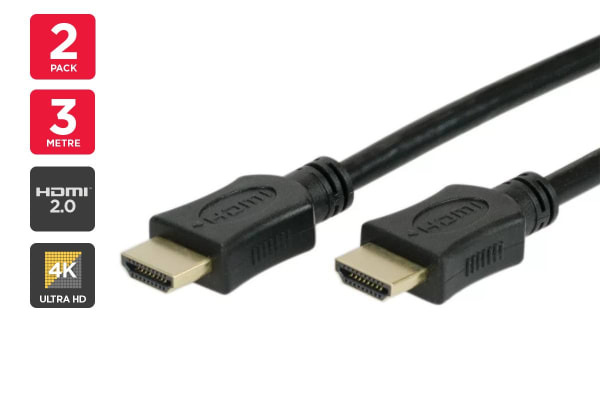 This handy 2-pack of 3m long HDMI 2.0 cables will allow you to experience all of your favourite movies, TV shows and games in incredible resolution. It’s been produced to the very latest standards of HDMI 2.0 High Speed, so you’ll have access to enhanced capabilities designed to improve your 4K viewing experience, including 3D viewing. Connecting your media devices with just a singular cable, the generous 3m length will ensure you get the perfect setup for your lounge room.